In May 2017 Cambridgeshire and Peterborough Combined Authority elected its first metro mayor, James Palmer for the Conservatives. He has control over the whole combined authority area, working with existing city leaders to take forward the strategic plan. You can find out more about the metro mayors on our FAQ page. 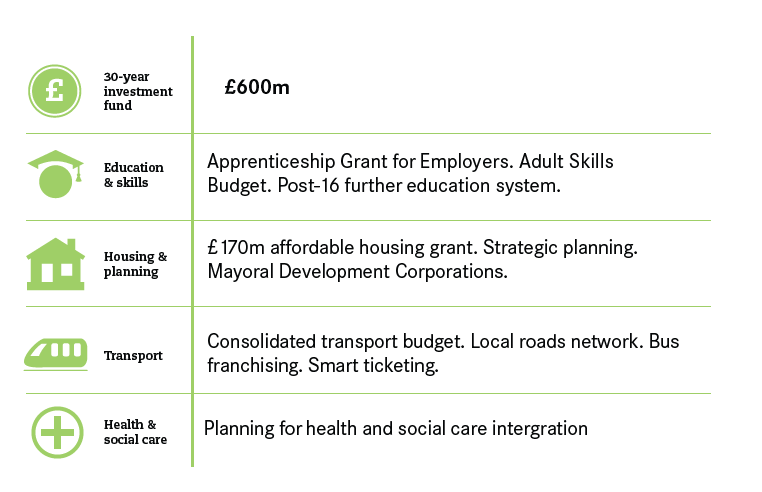 This page brings together the key facts and figures about the area’s economy and asks what local residents see as the top priorities for the new metro mayor. Understanding how the city-region performs on key areas such as productivity and employment helps the new metro mayor to assess what they should prioritise. The table below shows how Cambridgeshire and Peterborough compares to the national average on these indicators. You can also find data on areas that the metro mayor has the most power over on the Cambridgeshire and Peterborough Metro Mayor Data Dashboard. What powers does the Cambridgeshire and Peterborough metro mayor have? Below is a table detailing the powers that the Cambridgeshire and Peterborough metro mayor has. The original East Anglia deal is available here. What is the political landscape in Cambridgeshire and Peterborough? The current metro mayor is Conservative James Palmer who won with 57% of the vote after second preferences. Second was Liberal Democrat candidate Rod Cantrill with 43.7%. The turn out was 33%. Check ‘Getting ready for mayors’ for all the latest blogs, articles, events and research on the new mayors.